The crinoids, or sea lilies, or uncommonly encountered in the fossil record having complete crowns (heads) attached to articulated stems. Upon death, most crinoid heads fell apart rapidly due to decay of soft tissues. The famous Crawfordsville crinoid fauna of Indiana, USA is famous for its abundance of exceptionally preserved, articulated fossil crinoids (& other echinoderms). This crinoid occurrence is one of the most spectacular on Earth. The Crawfordsville crinoid fauna contains at least 63 different crinoid species (Ausich, 1999), many of which are quite sizable. 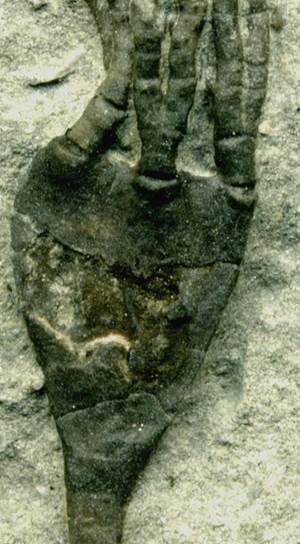 Shown below is a Dichocrinus ficus Lyon & Casseday, 1862, a relatively small crinoid species from Crawfordsville. The cup is reasonably well preserved, with arms attached and pinnules along the lengths of the arms. Dichocrinus ficus Lyon & Casseday, 1862 articulated crown & stem (total preserved length 4.35 cm) in fossiliferous calcisiltite from the Crawfordsville crinoid fauna (Edwardsville Formation, Lower Mississippian) near Crawfordsville, Indiana, USA. Ausich, W.I. 1999. Lower Mississippian Edwardsville Formation at Crawfordsville, Indiana, USA. pp. 145-154 in Fossil Crinoids. Cambridge, U.K. Cambridge University Press.